The recession made me a rather excellent cook. Back in 2007, when I graduated from my masters at the Industrial Design Centre, I chose not to sit for placements (because I didn’t want to be boxed in to one particular discipline at one particular company) and started my own design practice. Business was good back then, since I was on a stipend for an ongoing project with IIT and had a number of other projects running in parallel. Then, the recession hit. Projects ended and new work became scarce. Consequently, there would be days where I’d have to limit my entire weekly expenditure to ₨ 500. The only way I could pull this off was to re-discover local produce, which is always the cheapest and freshest, and learn how to cook it up in ways that would be both satisfying and nutritious. For the longest time I oscillated between tomato rice and chicken stews, but eventually learned to cook new things to satiate childhood cravings and to break the general monotony of eating the same thing every other day. Around this time, I also discovered a cooking show by Jamie Oliver that infected me with his contagious enthusiasm for good food and culinary creativity. I started experimenting with Italian (which Oliver excels in), French and other cuisines. If I were to think back to some of my earliest memories of the kitchen, they would go back to when I was two or three, or just about dexterous enough to help my mother stir a big (relative to me) bowl of batter. The familiarity with the scent of vanilla, flour and eggs, and they way they smell when blended into cake batter, meant that the kitchen was never a new frontier for me when I had to get used to one of my own. For the longest time I oscillated between tomato rice and chicken stews, but eventually learned to cook new things to satiate childhood cravings and to break the general monotony of eating the same thing every other day. I was learning a whole bunch of new things, and eventually started sharing them on a website I’d set up. It was called The New Vitruvian Man, based on the idea that we’re all renaissance people— our educations and professions might expect us to be good at only one thing, but there’s no reason we can’t choose to be good at other things too. I illustrated recipes and other food related things on this site. 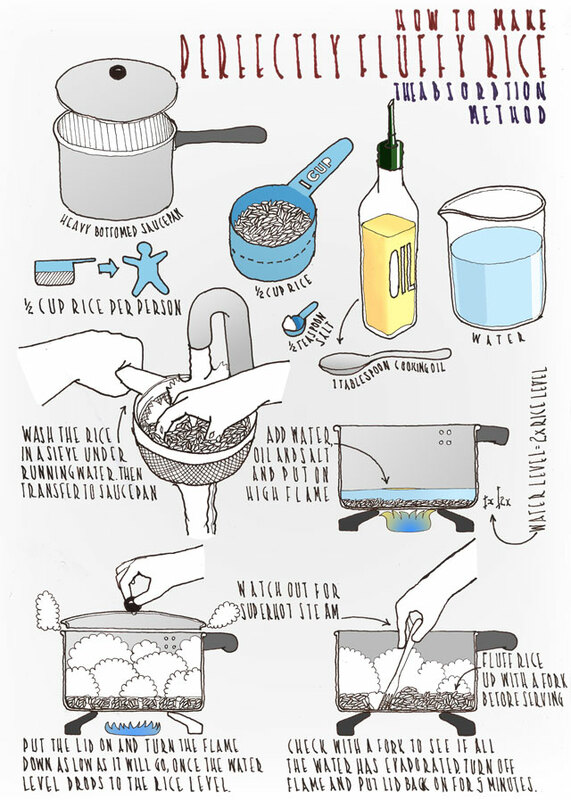 An illustrated description of how to cook perfectly fluffy rice. Once I’d gotten beyond cooking for sustenance and pleasure, curiosity drove me to try new things. I started taking pictures of the things I’d cook up, though the earliest pictures I took off my rather inadequate Nokia N81 were green tinted and awful. A couple of years later, I bought a smart(er) phone— the pictures got a lot better, and with the advent of Instagram, even more photogenic. I started putting up pictures of my latest culinary experiments on Instagram and Facebook and soon built up a small album of culinary experiments. Friends who’d seen the pictures on Facebook would ask me for the recipes, and this naturally led to the idea of setting up a food blog, where I’d document and write about all my culinary endeavours. Thus, on the 4th of July 2013, Magic Marinade was born. It took me nearly a month to come up with the name, which in itself is meant to reflect the thought that some ideas can not be rushed, and take a while to ‘marinate’ in mind and memory before they’re ready for the world. In a break from standard food-blogger tradition, where the norm is to eventually buy a fancy DSLR and style the food to the point where it could compete with the glossiest food magazine spread, I decided to only use my phone camera to shoot all the pictures I put up there. Every single image on Magic Marinade is taken on either my window sill or my bed, in natural light, with no special equipment or props. Occasionally, if the dish warranted it, I’d bring out some fancy crockery in the form of a set of ancient Noritake plates I inherited from my grandparents. Most of what I’d put up would be shot on a chakla, which is a well-grained circular piece of wood made for rolling chapatis on. In the same way that someone learning an instrument gains an eventual degree of comfort and familiarity (after much practice), I eventually started to freestyle and come up with my own recipes. In the beginning, I’d use a recipe I’d found online and add to it to enhance it with my own ideas and ingredients. One of the first such experiments was the product of a quest to come up with the booziest, drunkest cake possible. I called it my Chocolate Monk Nirvana, and it contained around 100ml of Old Monk Rum (a little over three pegs). My penchant for baking up boozy cakes might seem to imply a fondness of drink, but this is actually quite far from the truth. I, like my father before me, am a teetotaler, and cook or bake with more alcohol than I drink. I felt this disclaimer would be necessary before I talked about my next experiment, which was a Gin and Tonic cake. In a break from standard food-blogger tradition, where the norm is to eventually buy a fancy DSLR and style the food to the point where it could compete with the glossiest food magazine spread, I decided to only use my phone camera to shoot all the pictures I put up there. The title is pretty self explanatory— this was a cake with all the elements of a classic G&T, with the sweet-bitter of tonic water and the citric bite of gin with the flavour and perfume of lime thrown in. The body of the cake itself was drenched in gin, and the tonic water baked into its heart. A drizzle of freshly zested lime (ideally green) would give this cake the aura of lime, which you would breathe as you brought it close to take a bite. Cooking in itself is a creative exercise, and whenever I find myself in a creative rut, one of the best ways to snap out of it is to cook something up. Inhaling the scent of spices, vanilla or freshly baked bread can sometimes make for the best antidepressant. It can wake up sleeping senses and help revive a taxed, weary mind. Just as cooking things up help me revive my creativity as a designer, sometimes my design problem solving training would also help work out new, interesting recipes. My Strawberry Dark Chocolate Brownie Tart is one such. Strawberries and chocolate pair beautifully, and it seemed like a good idea to marry them in the form of a simple chocolate tart. 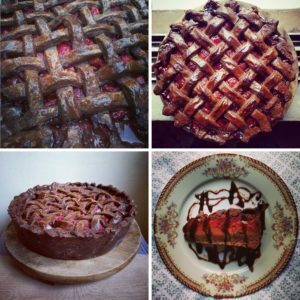 So sometime last year, towards the end of strawberry season, I decided to bake a chocolate tart with a pile of sugared, floured strawberries in a delicate chocolate pastry enclosure (pictured below, top left). I’d failed to consider how full of water strawberries tend to be, so when the tart was finally cut open, it gushed forth in a puddle of strawberry goo. A delicious strawberry goo, but a puddle nonetheless. I waited for strawberry season the next year and decided to give the tart another shot. Since the aforementioned strawberry gush was inevitable, I decided to add a dark chocolate brownie layer under the fruit layer, to soak in that strawberry gush and form a luscious dark chocolate brownie layer, with a zone of fusion between them, where they are both chocolate and strawberry at once. I eventually refined the recipe some more, by soaking the strawberries overnight in red wine and brown sugar. The flavour combination of red wine and chocolate is one that isn’t pursued enough, but does yield delicious results. The sugar pulls out a lot of the water from the strawberries and gives you this bowl full of red wine-strawberry juice and sugar that can be reduced down to a glistening syrup that can be drizzled over the tart (pictured above, bottom right). Most of the cakes and desserts I cook up tend to be with the minimal amount of sugar needed, just enough to bring out the natural flavour of the fruit, so the drizzle of sweet strawberry-red wine syrup helps highlight the flavours of the strawberries, with the crisp, almost savoury chocolate pastry and luscious dark chocolate brownie layer. A slice of this tart is meant to be eaten sideways (as opposed to vertically), so the three layers of pastry, fruit and chocolate sit on your tongue and slowly start to meld and merge as you chew. A simple Alphonso and Dark chocolate tart, made with Devgad Alphonso mangoes my neighbours donated. Cooking also makes for great PR, since I tend to share all of the more decadent things I cook up (with the primary intention of distributing the calories) with my friends, and more often with my neighbours. 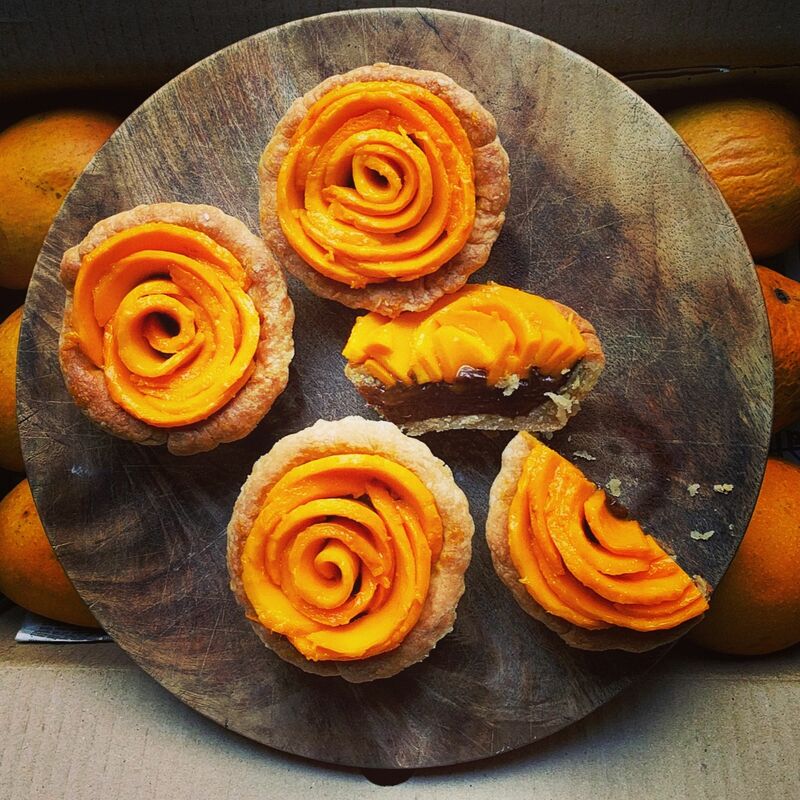 This season the neighbours gave me two boxes of alphonso mangoes from their farm, out of which I made simple alphonso-dark chocolate tarts, with slices of mango rolled into rosettes over a layer of dark chocolate ganache, made by mixing up cream, dark chocolate and a little butter. There’s virtually no sugar in these tarts (other than the sugar within the chocolate itself, and the pastry tart shell), to do justice to the incomparable flavour of the mango, with a gentle assist from the layer of dark chocolate ganache below. I’ve now written nearly forty recipes, which I’m currently working on compiling into a cookbook. Many of them are refined, advanced versions of the recipes on the blog, with a few special recipes written for the book. Most of the cookbooks I grew up with were written in the west, with ingredients alien to India, which would mean substituting those esoteric items (crème fraîche, Grand Mariner, lemon) with locally available ones (dahi, orange rind soaked in vodka or rum, lime). Cookbooks about Indian cuisine would of course contain local ingredients, but in line with my range of culinary interests, I’m choosing to cover French, Italian and other cuisines with our local fruits, vegetables, flours and spices. I’m aiming to release the book sometime this July, in time for Magic Marinade’s fourth anniversary. In the meantime, I’ll be continuing to document my culinary endeavours, on Instagram, along with seasonal flavours (mango being the current one) and other experiments in decadence. [MDes, IDC, ’07] Anand is an independent graphic designer and artist. When not designing books, magazines, logos or illustrating, he is an active gardener, culinary expert and amateur musician. He runs www.magic-marinade.com, a food and travel blog, and also www.thenewvitruvianman.com, where he writes and illustrates articles on design, gastronomy and music.